The white quilts is “Baby Nines” from the pattern by Connie Lancaster. 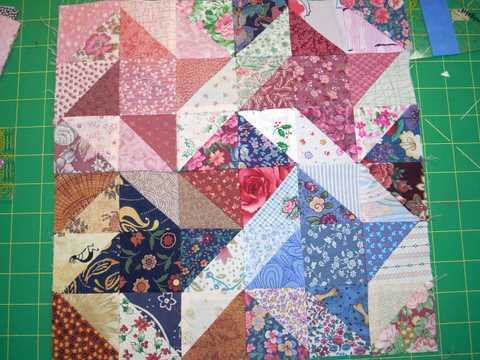 I first made this quilt several years ago for my girlfriends daughter. At the time DD loved it, so I saved all the leftover fabrics and purchased additional backing so that I would be able to make an identical one. 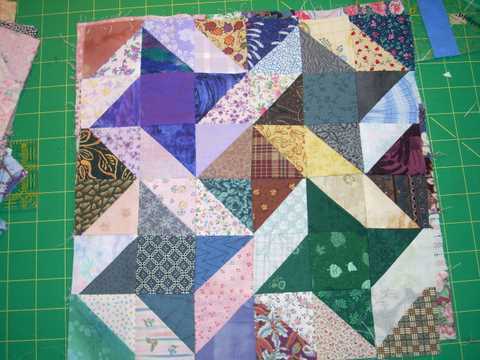 I love this pattern, its easy to put together and really danty. I decided to machine stitch the stems rather than applique them down so it can take the wear and tear I hope it gets. The second blanket is a flannel/minkie combo that I quilted using the Popcorn panto. The popcorn looks like sheeps wool in this application and fits the lamb theme perfectly. I’m a bit sad today. All summer long I’ve had a big orange spider (an orb weaver) living under the edge of my garden tool shed. She’s gone today. I looked high and low and don’t see her. The last few days her web has been rather ragged, and this morning it’s only half there. Usually, in the mornings her web is a beautiful circle which fills that corner of the flower border. I suppose that with the cooler nights, it was time for her to leave. I sure hope another takes her place next year. It’s been fun watching her at dusk on her web. Today was our guild meeting and the start of a new year for the officers and volunteers. Our guild holds alternating day and night meetings. The day meetings are also business meetings, and since January usually has numerous business items to take care of, it is also a potluck luncheon. I love potlucks because I always come away with a new delicious recipe. Today was no exception, and I eagerly await the directions for a refreshing tomato salad from my friend Susan. I’m sharing a wonderful cole slaw that I got from a forum. If you would like to have it, leave a comment and I’ll get it to you. The best thing about guild potlucks is the opportunity to sit and relax with friends, both new and old. Today I got to visit with Susan, Vicky and Ami. I wish I had taken my camera. I’ll have to remember to do that next month. Susan is corresponding secretary, Vicky has taken over the quilt bank, and Ami was head of Ways and Means last year and seems to take on whatever job needs to be done. Right now Ami is living in a past century — her outside water supply pipe has frozen and her family is having to tote water from a neighbors in order to have minimal water to take care of necessities. 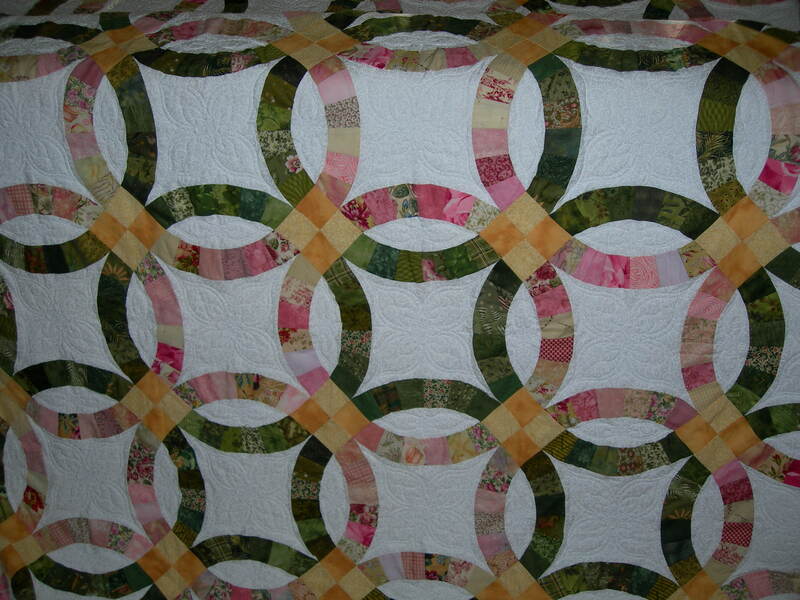 You can read about her challenge on her blog Enchanting Quilts. 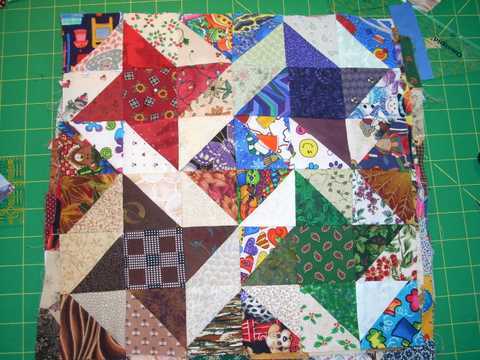 I thought I would post some pictures of blocks from my century-spanning UFO — a charm friendship star. I started this in 1999 with hopes to have it done for the new millennium. I originally swapped charms on AOL in the mid-90’s when AOL was a major hub on the web. I ran out of light colors and put the whole thing in a wire basket and left it to age. This year I’ve been swapping lights and have now completed 20 of the 30 blocks. YEA!! Each block has 68 different fabrics. I decided to create a blog… sort of like giving myself a present!! I love to read blogs. They inspire and motivate me. Sometimes I get so inspired I leave the computer and go do something!! My current project is a vest made from leftover DWR segments from the quilt I made for my daughter’s wedding. I started it in February 2005 when they were engaged and while I finished the top in time for the wedding, the quilting was finally finished it this summer in time for their second anniversary. Like most of us, I have a UFO list. My goal this year was to finish at least one UFO each month, and I think I came close to that. I only have a few items left, and I think of them as WISPs (works in slow progress). One of those is a charm friendship star that I started in 1999 for the millenium. I ran out of lights and so progress slowed to a standstill. I’ve been swapping nickels on-line and now have a new stack of lights, so I can resume working. I need to have 30 blocks and I have only 16 done. Of those 16, I think I might have to replace 3 because the contrast isn’t what I want it to be. In the 7 years since I started it, my eyes are seeing things differently, and what use to look good doesn’t anymore. 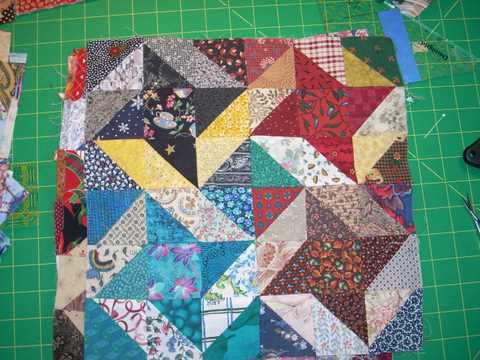 My goal this year is to finish the friendship star and also to finish the quilting on the NY Beauty. That’s a whole other story I’ll tell another day. We’re leaving in a couple of days to spend Christmas and New Year’s in central Pennsylvania with our daughter her hubby, so if I don’t get back here before we return, I wish each of you a peaceful, wonderfilled Christmas and a safe Happy New Year.